We can help you become an expert in making sugar art. We deal in innovative sugar art supplies for entry level or beginners and professional bakers as well. 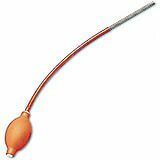 Our online stock of sugar art supplies includes the offerings like copper sugar pump for blown sugar and sugar / creme brulee torch for letting you to blow sugar for creating exotic cakes and pastry decorations. With the stuff like sculpting tools and sugar art scissors, you would find it incredibly easy to sculpt sugar or marzipan / almond paste for making artistic confectioneries. In this section, we have also got latex sugar art gloves in different sizes, so that you can ensure hygiene in your bakery's kitchen. 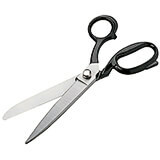 Use these Scissors to cut your sugar decorations made of pulled sugar or blown sugar. In finely polished stainless steel with black lacquered handles. Measurements: 9 1/4" L. Weight: 8 oz. 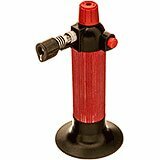 4.75" X 2.75" X 7.12"
14" x 2.37" x 2"
If you are into sugar art this pump made of rubber and copper tip will help you do beautiful Sugar sculptures. 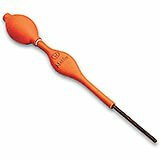 The best pump available for all your blown sugar and sugar art. Delivered with one copper tip. Measurements: 14" x 2 3/8" x 2". Weight: 1 oz. 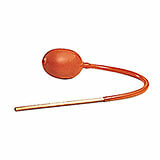 If you are into sugar art this pump made of rubber and copper tip will help you do beautiful Sugar sculptures. Made of rubber and copper. Length 10". Copper Tip is 5 1/8" long. Weight: 4 oz. 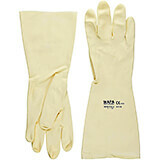 Sugar Work Gloves, protect your hands when working with blown or pulled sugar. Made of latex. Size: Large. 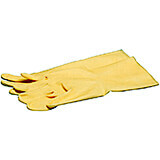 Sugar Work Gloves, protect your hands when working with blown or pulled sugar. Made of latex. Size: Medium. Sugar Work Gloves, protect your hands when working with blown or pulled sugar. Made of latex. Size: Small. 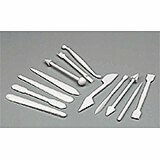 This Paderno World Cuisine set of 15 marzipan tools are designed to quickly perform detailed sculpting on marzipan, gum paste or fondant in order to create decorative figures, flowers and animals. The set includes 24 different tools, along with two scrapers and a knife. The knife is also sold separately. 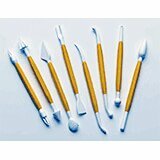 To make the perfect confection or cake made of or based on marzipan you need the correct sculpting tools. Each sculpting tool consists of 2 tools, one at each end in composite material. Box of 12. Measurements: 5 1/8" L. Weight: 3 oz. 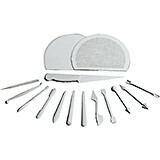 To make the perfect confection or cake made of or based on marzipan you need the correct sculpting tools. Made of plastic. For decorating of Marzipan to cut flowers, ridges, dimples, etc. Shapes include: fine bone, blade and shell, marbles, comb, cone, needle, insert knife and cones 5 and 6 stars. Box of 8. Each tool's length 6". Weight: 4 oz. 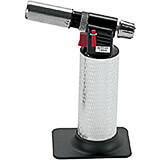 3.12" X 2.88" X 7.88"
This professional kitchen blow torch is the essential kitchen tool to make creme brulee or sugar art. Very convenient model, indispensable for all sugar work. Very good grip. Base incorporated to always keep the blowtorch upright. 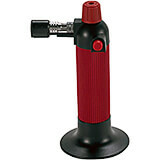 Can be refilled in a few seconds with universal butane lighters refills. Adjustable flame. Automatic lighting. Butane not included. Measurements: 3" W x 6" H. Weight: 8 oz. This 17.75 inch by 3 inch Paderno World Cuisine rubber sugar pump is used to create delicate three-dimensional objects made of sugar. The small tube is placed in the hot, malleable sugar paste, and the bulb at the end is squeezed to pump air into the sugar. The air flows at a constant rate through the long rubber tube. 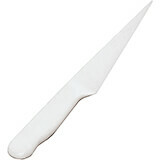 This Paderno World Cuisine almond paste knife performs detailed sculpting on marzipan, gum paste or fondant in order to create decorative figures, flowers and animals. The knife is also sold separately. This 9-9 1/2 size Paderno World Cuisine pair of sugar gloves is made of non-flock latex and are designed to handle sugar during confectionery work. This 8-8 1/2 size Paderno World Cuisine pair of sugar gloves is made of non-flock latex and are designed to handle sugar during confectionery work. This 7-7 1/2 size Paderno World Cuisine pair of sugar gloves is made of non-flock latex and are designed to handle sugar during confectionery work.